LINES ROCKING HORSES ....... One particular stable that is well documented for Rocking Horses is that of G & J Lines (1850-1931), a family firm established in the middle of the nineteenth century. In 1876 Joseph, aged 28, with outside experience in the toy trade joined his brother George who was already making wooden rocking horses. In the same year they established premises at 457 Calendonian Road (in the Steam Works Factory). As the business continued to grow, other factories were taken over or rented and in the late nineteenth century the premises of G & J Lines were claimed to be the large toy factory in Britain. Many of their horses carried their trademark: a thin metal disc stamped with a thistle. 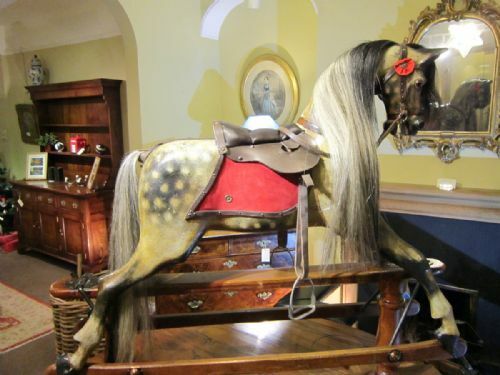 Their horses were sold by Gamages, Hamleys and Selfridges. One of the brothers, Joseph retired in 1900 and his place was taken by his nephew with the same name Joseph, the eldest son of the other brother George. The nephew Joseph, together with his two brothers, set up a second enterprise after the end of the First World War, Lines Brothers (1919-1972): their horses are marked Triang or Triangtois and were made in the traditional manner, not only in their large British factories but also in their Australian and Canadian subsidiaries. The photo above is a lines sportiboy with the Triang triangle mark on. 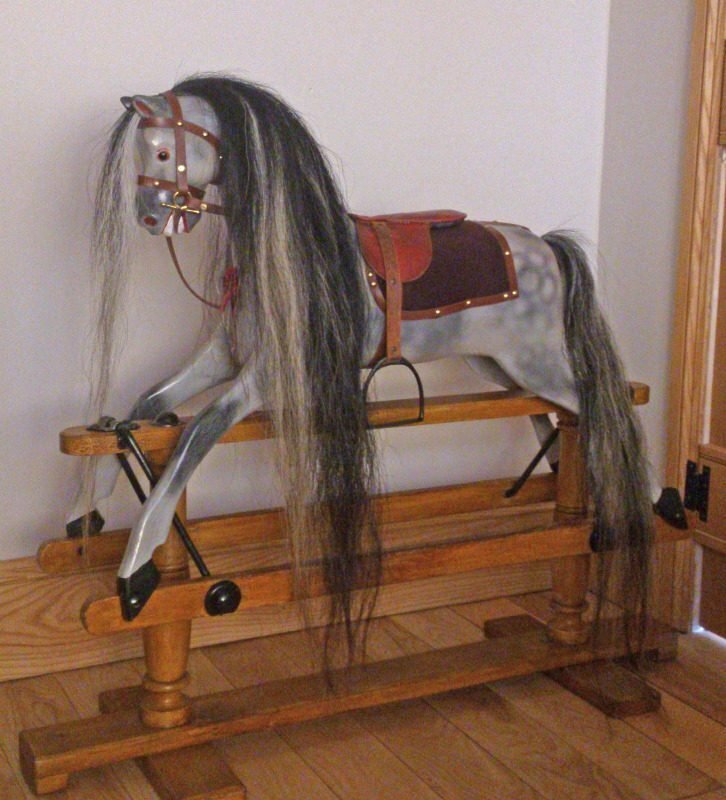 G & J Lines produced rocking horses, 'gallopers and ostriches' for fairground rides ie like the Savages fairgrounds rides, life size dummy horses for tailors and saddles, horses' heads for pubs and shops, tricycle horses, stool horses, pole horses, horse and carts and other large wooden toys. Earlier models of wheeled toys had wooden wheels, later models had metal wheels made in Birmingham. In 1914, the five ramshackles and scattered workshops occupied by G & J Lines were replaced by one large factory at Tottenham. Mr. G Lines' three younger sons set up their own factory in the Old Kent Road in 1919. Their trade name Triangtois and later Triang dates from 1927. To recognise a lines horse they generally have more flared nostrils and sometimes a breast plate can be found. They can have rounded runners, turned pillars and can also be identified by their brackets which has markings on. Early G& J Lines horses are just as sought after and collectible as FH Ayres and most collectors strive to have both in their collections. Pics show early lines horse with original paint this particular horse has a badge to depict it was made during the reign of Queen Victoria (the plaque shows her photo), the next is a fully restored G & J Lines extra carved and then we have a little Lines sportiboy (later) and lines brackets.